Learn how to grow a carob tree for its chocolate substitute edible pods or as an ornamental plant. 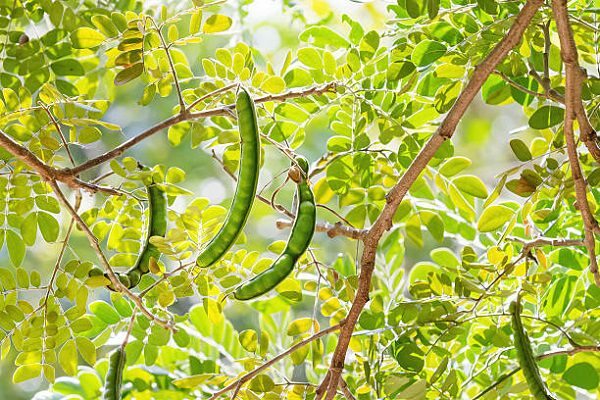 Growing Carob Tree is easy in warm climates. 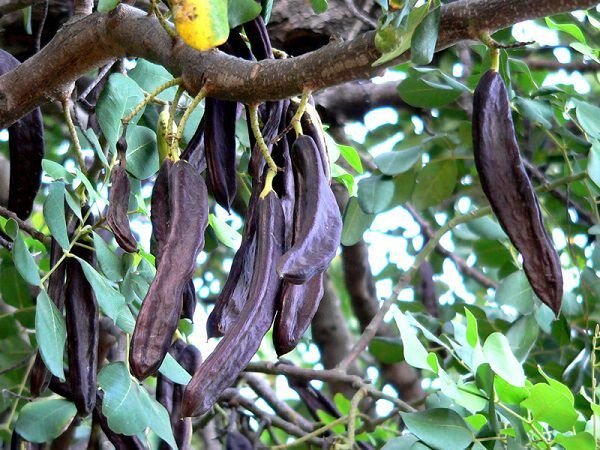 Carob tree is a tough and durable evergreen tree native to the Mediterranean regions and belongs to the legume family. It’s promoted as a chocolate substitute, although the taste is a bit different–much sweeter with a hint of chocolate, less bitter and a way more nutritious. It has bright, green beautiful foliage, cluster of small flowers and edible pods that are used as cocoa powder substitute. Carob pods contain about 8% protein, vitamins A and B and about one-third of calories than chocolate. Carob tree grows about 10 meters tall (exceptionally 15 m). It is a dioecious tree, which means each tree bears male or female flowers. Carob tree can tolerate temperature down to 20 F (-7 C) temperature. It has a thick and twisted trunk with rough and brown bark. 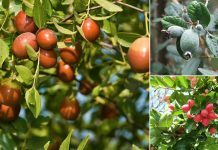 The leaves are oval, dark green and shiny and 12 to 30 centimeters long. The foliage provides welcome shade in hot countries. They form a very effective curtain against noise too. The fresh carob tree seeds germinate quickly and easily. If you don’t find fresh seeds, you can grow it from dry seeds that are scarified and soaked in water until they double in size. 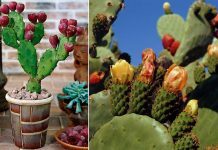 They can be planted in spring or fall. Tip: Instead of growing from seeds, buy a sapling from a nursery. 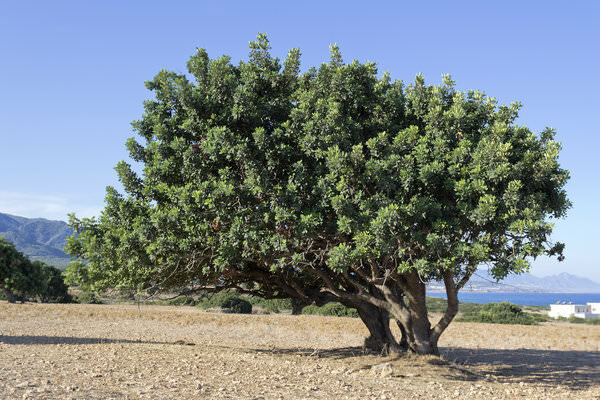 Carob tree needs full sun and a position sheltered from the wind. If growing in a hot climate, it’ll not mind growing in a position that receives partial sun. The carob tree grows in difficult positions and poor soil including sloppy hillsides with deep sandy soil or loam, even arid. It does not tolerate acidic or wet soils and requires adequate drainage. It is resistant to drought and grows well in lack of water. 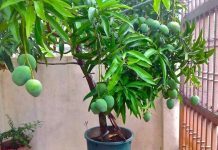 However, watering must be provided during dry seasons, especially if the tree is grown for its fruit. Carob tree care is easy! The tree is ideally grown in regions with a Mediterranean and Middle Eastern frost-free warm climates. It’s cold tolerant as well–a fully developed carob tree can withstand temperatures down to 20 F (-7 C), but frost during flowering period can reduce or sometimes prevent fruiting. Fertilizer is often unnecessary for carob trees. Side dressing the plant with well-rotted manure, twice a year is sufficient. Additionally, a dose of 8-3-9 ratio fertilizer can be applied occasionally to give the plant a boost. It’s a wild tree, which means you can leave it without pruning. However, pruning carob tree when it is young helps it attaining the desired shape you want. The tree must be pruned regularly so that air and light can penetrate. Young stems can be removed without affecting the production of carob. Also remove the tangled, weak and any damaged or diseased branches from time to time. There are only a few pests and diseases that disturbs this tough tree. Be aware of squirrels, scale insects, and carob moths. In diseases, it gets killed due to root rot because of overwatering. After flowering in the fall and winter, carob tree develops the edible seed pods in the spring. You can pick the pods when they are green and soft and about 4-5 inches long. You can consume the green pods raw for the sweet pulp inside. Wait for the summer to pick ripe, dark-brown pods that are looking big and healthy. Check out this article to learn more.